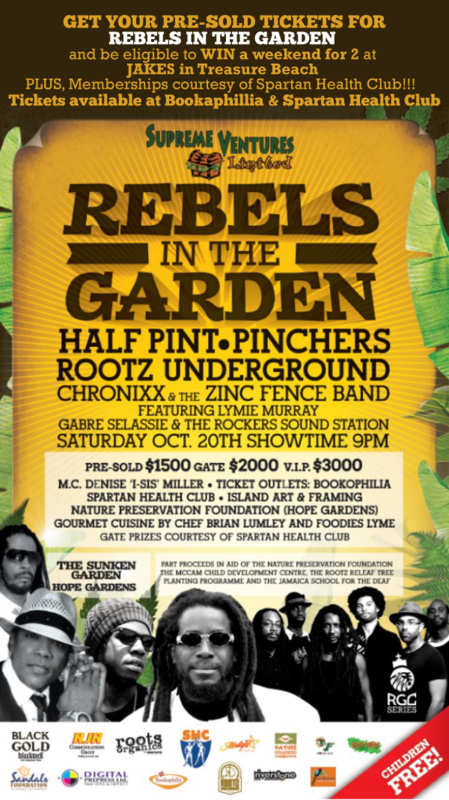 October 20, Rootz Underground presents A Rootz Garden Concert with performances by Rootz Underground, Half Pint, Pinchers, Chronixx & the Zinc Fence Band ft Lymie Murray and Gabre Selassie with Rockers Sound Station. Tickets: Pre-Sold: General -$1500, Food Inclusive VIP – $3000. $2000 at the Gate. Gates open at 7pm, Showtime at 9pm. Proceeds go to charity including the Nature Preservation Foundation, Rootz Releaf – School Tree Planting Programme, The McCam Child Development Centre & the Jamaica School for the Deaf.